I wasn’t planning on buying merch. I got a T shirt and some stickers. 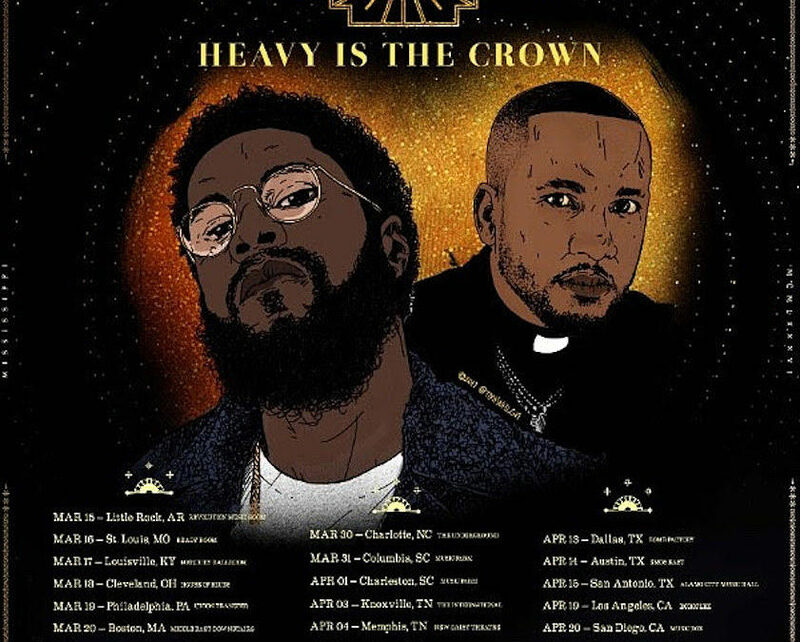 Recently, I witnessed the very first stop on The Heavy is the Crown Tour at the Rev Room in Little Rock, Arkansas. I arrived two hours early, got a taco at the Rev Room’s restaurant, Revolution Taco and Tequila Lounge, and was able to be the first person in line to see the show. While I waited, I struck up a conversation with some of the other fans that arrived after I did. When the doors finally opened, I got as close to the stage as I could behind the folks who paid for early entry. I was about just left of center stage and two people back. The duo was followed by special guest Childish Major and his DJ, Groove. I was unaware that he was going to be opening, but I was pleasantly surprised. I had only heard CM’s music about a week before when his song “Birthday” came up on my Spotify recommended. CM’s energy was great live and his songs were quite melodic and vibrant. His acapella rapping was also a treat to hear live. At one point, towards the end of his set, he jumped in the crowd right next to me and formed a circle in the crowd. Up next was CyHi The Prynce. The GOOD Music veteran stepped on to the stage with much more swagger and gravitas than expected from his short stout figure. Anything Cyhi was missing in stature he made up for in rapping ability and charisma. He played mostly songs from his newest album No Dope on Sundays, but also threw it back to some GOOD Music classics such as his verse on Kanye West’s “So Appalled.” He made great use of the sermon excerpts from his album as part of the stage show and kept up the biblical imagery by his body language during one particular part of his performance. But then, it was finally time for Big K.R.I.T. to take the stage. Anticipation was building as the stage was cleared and the booth was moved off of the stage. For some background information, I had seen Big K.R.I.T. once before at my first real concert on the Cadillactica Tour. It still ranks as one of my all-time favorite concert memories, and I was wondering if this concert would at all match up to the previous experience. Then, all of a sudden, the giant scene on the back of the stage that I had not previously noticed, jolted to life. With a blast of brilliant visual static, Big K.R.I.T. arrived on stage. He was no longer the country rap astronaut that he was on the Cadillactica Tour, although he did bring the heavens with him. This was a K.R.I.T. that had returned from orbit, reminding rappers why he was not only king of the south, but king of all of hip hop’s terrestrial domain. This most recent incarnation of the King Remembered In Time was mature and evolved, but gained power from all his previous incarnations. K.R.I.T. opened with the song “Big K.R.I.T.” off of his newest album 4eva Is A Mighty Long Time. The song was a great opener and the crowd rapped the song right back to him. He continued with cuts from the first half of the new double album such as “Big Bank” and “Subenstein (My Sub IV).” The visuals and lights that went along with his performance were perfectly dazzling and captured the explosive trunk knocking energy of the music. After he played through a series of bangers from the first disc, he momentarily left the stage while the screen showed a purple galaxy as if the crowd was being transported warp speed through time and space itself. During this intermission, the DJ played a mix of songs from K.R.I.T.’s back catalogue including some of my favorites like “Rotation” and “Mt. Olympus.” The crowd stayed completely engaged though this flurry of throwbacks and continued to rap along to all the lyrics as if K.R.I.T. was still on stage. K.R.I.T. then reemerged without his shades to perform songs from the second disc of 4eva is a Might Long Time. Some standouts were “Drinking Sessions” and “Mixed Messages.” He closed the show with “Burry Me In Gold”. But before the show was really over, he resurfaced once more – this time wearing a custom Multi Alumni preacher’s robe to preform “Keep The Devil Off” as his encore. After he finished his performance, he walked from one end of the front of the stage to the other shaking the hand of everyone he could reach as the instrumental to “Justin Scott” played. I was able to shake his hand, say a few words to him, and see face to face what a humble guy Big K.R.I.T. actually is. Long live the King. 4eva is a Mighty long time.